In September, Etowah County Sheriff Todd Entrekin and his wife Karen purchased an orange four-bedroom house with an in-ground pool and canal access in an upscale section of Orange Beach for $740,000. To finance the purchase, Entrekin got a $592,000 mortgage from Peoples Bank of Alabama, according to public real estate records. The home is one of several properties with a total assessed value of more than $1.7 million that the couple own together or separately in Etowah and Baldwin counties. But ethics disclosure forms Entrekin filed with the state reveal that over the past three years he has received more than $750,000 worth of additional "compensation" from a source he identified as "Food Provisions." Entrekin did not deny that he received the money when asked about it via email last week. Ethics forms he filed in previous years do not list any income from such a source. Entrekin told AL.com last month that he has a personal account that he refers to as his "Food Provision" fund. And Etowah County resident Matthew Qualls said that in 2015 Entrekin paid him to mow his lawn via checks with the words "Sheriff Todd Entrekin Food Provision Account" printed in the upper-left corner. AL.com viewed a photograph of one such check. The money in the account was allocated by federal, state and municipal governments to feed inmates in the Etowah County jail, but was not used for that purpose and was instead personally pocketed by Entrekin. "In regards to feeding of inmates, we utilize a registered dietitian to ensure adequate meals are provided daily," Entrekin said Sunday via email. "As you should be aware, Alabama law is clear as to my personal financial responsibilities in the feeding of inmates. Regardless of one's opinion of this statute, until the legislature acts otherwise, the Sheriff must follow the current law." Many Alabama sheriffs contend that the practice of keeping "excess" inmate-feeding funds for themselves is legal under a state law passed before World War II. Yet in a number of counties including Jefferson and Montgomery, any money allocated to sheriffs for feeding inmates that is not used for that purpose is instead turned over to the county government. Entrekin reported on forms he filed with the Alabama Ethics Commission that he made "more than $250,000" each of the past three years via the inmate-feeding funds. Tom Albritton, executive director of the ethics commission, said via email that the state does not require public officials to disclose exactly how much more income they received from a single source beyond the $250,000 threshold, which he said is "specifically set in the statute." 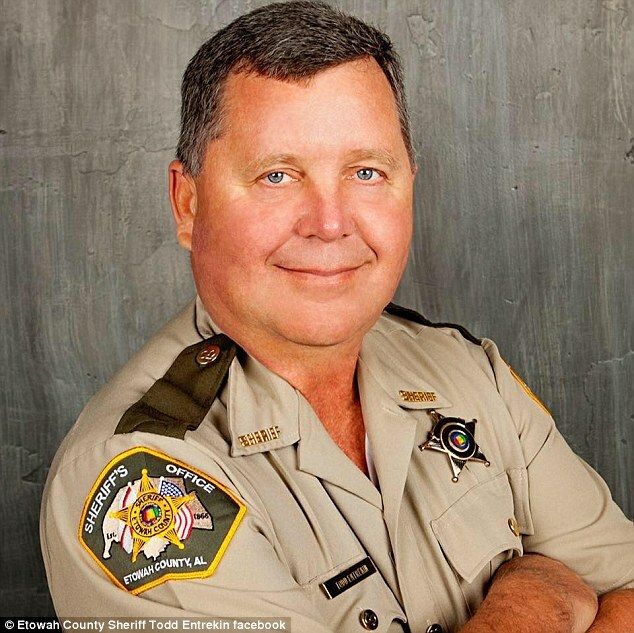 Meanwhile, Entrekin's annual salary as sheriff is $93,178.80, according to Jeff Little, human resources director for the Etowah County Commission. "I believe the funds belong to the taxpayers and any excess funds should go toward things that benefit the taxpayer," he said in a March 1 phone interview. "There's been a tremendous amount of money left over that shouldn't be used as a bonus check." Entrekin does not use the funds allocated for inmate feeding to purchase "food trays" and certain "food service supplies" for the Etowah County jail, which the county instead pays contractors to supply, according to county records. Etowah County currently has an open bid posted on its website for a contractor to provide "food trays" for the jail. The county awarded a fiscal year 2014-2015 contract to provide the trays to a Birmingham company called Design Specialties, Inc.
"Some of the supplies the county does provide for the jail. That may be one of them," David Akins, chief administrative officer for Etowah County, said when asked in a phone interview whether the county pays a contractor to supply the jail with food trays. He declined to provide additional information about county contracts for jail-related items. The county awarded contracts for "food service supplies - jail" for fiscal years 2011-2012 and 2014-2015 to Osborn Brothers, a Gadsden company. Information about the specific supplies the company provides is not publicly available. Osborn Brothers, which did not respond to a request for comment, contributed $2,000 to Entrekin's campaign under the name Osborn Foodservice in October 2013. Horton said that Hayes used the funds he was allocated for feeding inmates to pay for trays and other kitchen supplies. "I worked for the previous sheriff, Sheriff Hayes, and my understanding then was the sheriff personally owned and bought and purchased all the trays and utensils, all the hardware, and handled the operation of everything to do with food in the jail," Horton said. Entrekin provided a two-sentence response to a series of detailed questions about the county contracts for jail needs and campaign contributions from companies that provide products and services for the county. "You should understand that in the State of Alabama, the sheriff does not have the legal authority to enter into contracts," he said via email. "According to the law, contractual authority is the responsibility of the County Commission." On Feb. 1, Entrekin's campaign received one of its largest single contributions to date: $5,000 from Network Communications International Corporation (NCIC.) Etowah County awarded the Texas company a contract to provide "inmate telephone services" on Sept. 20, 2016. NCIC did not respond to a request for comment. Chevrolet of Boaz contributed $500 to Entrekin's campaign in October 2013. It contributed another $1,000 to his campaign in October 2017 under its former name, Kilpatrick Chevrolet. In December 2014, Etowah County awarded Chevrolet of Boaz a contract to provide the sheriff's office with a "1500 Crew Cab 4WD Truck (or comparable.)" The dealership did not respond to a request for comment. On the evening of Feb. 20, Entrekin hosted a gala campaign fundraiser in a rustic lodge at Otter Creek Farm in Ohatchee. Featuring a fully stocked bar, fruit and cheese platters, and large polished bowls piled high with shrimp, the event was a veritable who's who of Etowah County politics and society, with local leaders including state Sen. Phil Williams, District Attorney Jody Willoughby and District Judge Joe Nabors in attendance. Peoples Bank - the bank that gave Entrekin the $592,000 mortgage to pay for his $740,000 Orange Beach home - contributed $1,000 to Entrekin's reelection campaign on the date of the fundraiser. It was the single largest contribution from the company to an individual politician listed on online state campaign finance forms going back to July 2013. Neither Entrekin nor Peoples responded to questions about their relationship. The official printed invitation to Entrekin's Feb. 20 fundraiser did not include a request for attendees to donate to his campaign, but records filed with the state show that the campaign brought in $32,600 on the day of the event. Pitching in $1,500, Jim's Asphalt was one of the 65 people or companies that contributed to Entrekin's campaign on Feb. 20. The Southside company's founder, Jim Brannon, attended the fundraiser in Ohatchee that evening. In July 2015, Etowah County awarded Jim's Asphalt a contract to provide "hot plant mix paving material." The contract has been renewed each subsequent year and the current contract period ends in July. The company did not respond to a request for comment. Entrekin and his wife Karen - who worked for years as a probation officer and met her husband in the Etowah County Sheriff's Office, according to a profile by the Alabama Republican Party that described the sheriff as a "rising Republican star" - own several properties in Etowah County and two others in Orange Beach. The $740,000 Orange Beach home is the most expensive of their properties, but they also own a second single-family house in Orange Beach that was assessed at $200,900 in October 2016, according to Baldwin County real estate records. Entrekin stated on an annual form he filed with the Alabama Ethics Commission in January that he owned two Orange Beach properties classified as "real estate for investment or revenue production." He stated that he received "less than $10,000" in income from each property last year. He did not list any Etowah County investment properties on that disclosure form. In Etowah County, Entrekin is identified in county real estate records as the sole owner of one property in Gadsden and another in Hokes Bluff. He and his wife are listed as jointly owning a handful of other properties in Gadsden, where Karen Entrekin is listed as the sole owner of one more property. The total assessed value of their Etowah County real estate holdings is more than $990,000, according to county records. In April 2017, Todd Entrekin stated in his annual filing with the Alabama Ethics Commission that he owned two Orange Beach properties worth between $150,000 and $250,000 and two more in Etowah County. He classified all four properties as "real estate for investment or revenue production," and stated that each brought in less than $10,000 in 2016. He wrote on the form that his investment property in Rainbow City was worth between $150,000 and $250,000, and that the one he owned in Hokes Bluff was worth between $100,000 and $150,000. Entrekin did not provide any further information about his homes, his finances, or his campaign in response to a series of detailed questions.